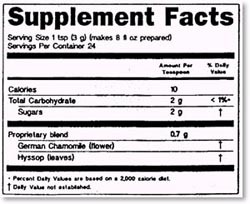 On March 23, 1999 new rules went into effect for labeling of dietary supplement products including a new information panel titled "Supplement Facts". Products labeled prior to March 23rd can continue to be sold until stocks are depleted. 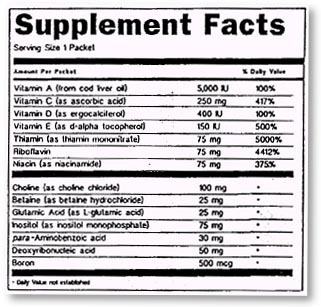 The "Supplement Facts" panel must include specific information about ingredients in the product. It is similar in format to the "Nutrition Facts" panel that appears on most processed foods. A new dosage recommendation standard called DV (daily values) must be included in the Supplement Facts panel for ingredients where a DV has been established. DVs are based on DRIs (dietary reference intakes). "DRI" is an umbrella term for groups of values -- including RDAs, AIs, EARs, and UIs -- that specify recommended dosages proposed by the Food and Nutrition Board of the Institute of Medicine of the National Academy of Sciences in partnership with Health Canada. This is a departure from the U.S. RDAs used on food labeling in that DRIs attempt to incorporate new information about nutrition needed to prevent disease. A statement of identity must appear on the front panel of the product label. The statement must use the terms "dietary supplement" or a term identifying the contents of the product, such as "Vitamin C supplement" or "Herbal supplement". All ingredients in the product must be declared in the ingredient statement or within the "Supplement Facts" panel. The manufacturer's suggested serving size for consumption at one occasion. All ingredient information must be based on this serving size. Information on nutrients when they are present in significant levels, such as vitamins A and C, calcium, iron, and sodium, and the percent Daily Value recommendation for consumption where a reference has been established. All other dietary ingredients present in the product, including botanicals and amino acids, for which no Daily Value has been established. They must be listed below those with a DV separated by a bar. The quantity present in each ingredient must be listed and they must be identified as having no DV. Herbal products must be identified by the common or usual name and the part of the plant used to make the supplement (such as root, stem or leaf). If the common or usual name is not listed in Herbs for Commerce published by the American Herbal Products Association (see description), the Latin binomial name such as Tercoma mollis.HBK or Cecropia obstusifolia Bert. must be listed. Proprietary blends may be listed with the weights given for the total blend only. When this is done, components of the blend must be listed in descending order of predominance by weight. The rule also specifies a minimum type size and flexible formats. "High potency" may be used to describe a nutrient when it is present at 100% or more of the RDA established for that vitamin or mineral. "High potency" may also be used with multi-ingredient products if two-thirds of the nutrients that are in the product are present at levels that are more than 100% of the RDA. "Antioxidant" may be used in conjunction with currently defined claims for "good source" and "high" to describe a nutrient where scientific evidence shows that following absorption of a sufficient quantity, the nutrient (such as vitamin C) will inactivate free radicals or prevent free radical-initiated chemical reactions in the body. In addition, the label must include dosage directions, the net quantity of the contents (eg, 100 tablets), and the name and place of business of the manufacturer, packer, or distributor.